At Sheppard Pratt, we believe that mental health and physical health go hand in hand. That is why we make smoking cessation resources available to everyone we serve. Over eighty percent of patients on our inpatient co-occurring disorders unit, and 49 percent of all of our adult inpatients, are smokers. Compared with 15.1 percent of the U.S. adult population (as of 2015), smoking is clearly a staggering problem among those afflicted by mental illness. The negative health effects of smoking can be truly dangerous — both to smokers and their loved ones. Smoking is the main preventable reason that causes people with mental illness to die about 15-25 years before their peers. Smoking is necessary self-medication. False! Smoking does not help with psychiatric symptoms. There is some temporary benefit to attention, but that only lasts a few minutes. People with mental illness aren’t interested in quitting smoking. False! At Sheppard Pratt, about 75 percent of patients who smoke are either planning to quit or are already on the fence. People with mental illness can’t quit smoking. False! Many research studies show that people can quit, no matter their diagnosis. Quitting smoking worsens psychiatric symptoms. False! After quitting, psychiatric symptoms improve, and hospitalizations decrease. People are even better at staying clean from other substances when they quit smoking at the same time; this may be because people learn healthier ways to cope with tough feelings. Smoking cessation treatment isn’t an important part of mental health care. False! The mental health field has begun to focus on smoking cessation as an important part of the physical and mental health of our patients. 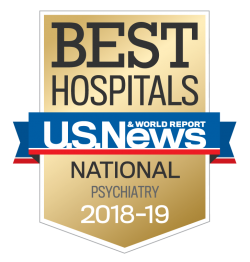 The Centers for Medicaid and Medicare and the Joint Commission have even recently required psychiatric hospitals to offer smoking cessation programs. As you can see above, none of these myths are true. When we opened the doors to our brand new Weinberg building in 2005, we wanted to ensure that we were treating our patients with the best, most holistic care possible. So, we launched a smoking cessation program to benefit both patients and employees. As a series of smoke-free campuses, we do not allow traditional tobacco or e-cigarette products. Smoking is prohibited on all Sheppard Pratt Health System grounds, and we provide complimentary smoking cessation treatment for any patients and employees for whom it would be useful. When a patient who smokes is admitted, we aim to prevent nicotine cravings and help them to consider smoking cessation. How do we do this? At this time, our smoking cessation program reaches most adult smokers in our hospitals. In fiscal year 2018, approximately 76 percent of inpatient smokers received smoking cessation counseling. In the first three years of our smoking cessation program, more than 4,700 patients have received smoking cessation treatment. This program is funded in part by grants from the Maryland Department of Health and Mental Hygiene. We are able to sustain this initiative thanks to the hard work of Rachel Smolowitz, Ph.D., our smoking cessation coordinator. Questions about our smoking cessation program? Contact Dr. Smolowitz at 410-938-5234 or email rsmolowitz@sheppardpratt.org.